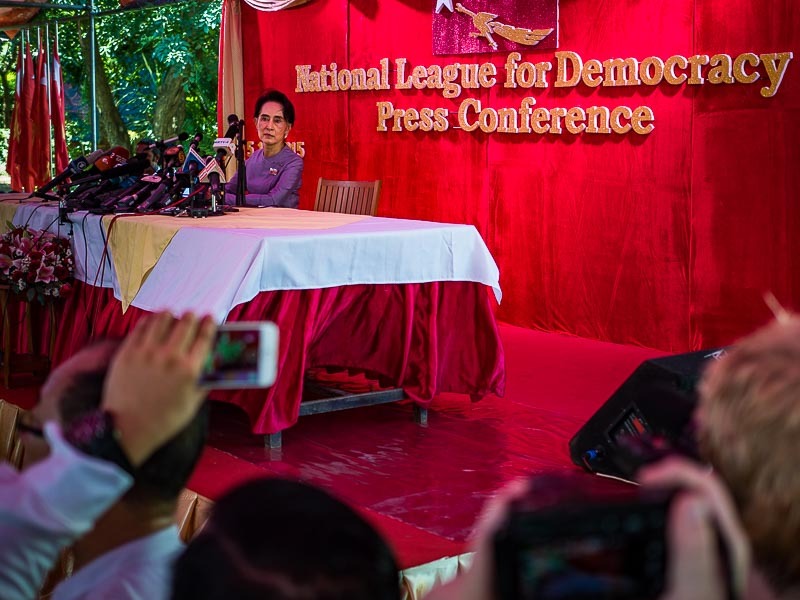 Aung San Suu Kyi answers reporters' questions during a press conference at her home Thursday. 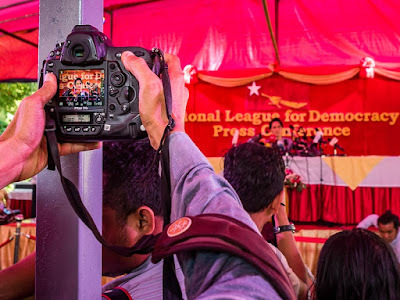 Nearly 500 journalists came to Aung San Suu Kyi's Yangon home Thursday morning for a final pre-election press conference. The press conference was scheduled to start at 9AM and the gates were going to open at 7AM. I got there about 6.30 and was about number 75 in line. By the time the gates opened, I was toward the front of the line - hundreds of people were lined up behind me. She's without a doubt the most sought after interview of the campaign. I don't know who's going to win the election. Polling here is not very effective, so anyone who says the "know" who's going to win is just guessing. The Lady walks out her front door for the short stroll to the press conference in her garden. 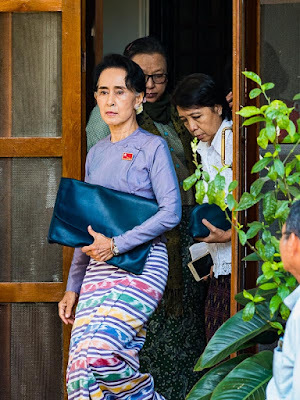 She served 15 years of house arrest in the home during the dark days of Myanmar's dictatorship. The press conference itself was interesting. Daw Suu (Daw is an honorific used with Burmese women) answered questions for about 90 minutes. She was poised, confident of victory and on point. Photographing Aung San Suu Kyi at the press conference. At one point a reporter asked her if she would accept a USDP (the incumbent government party) victory if it was honestly won. Daw Suu said something like (and I'm paraphrasing here) "why would anyone vote for the USDP?" 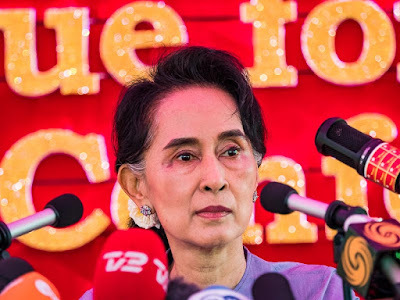 She was asked what would happen if the NLD won, and who would serve as president, because she is constitutionally prohibited from being president. She said that she would be "above" the president. When another reporter rephrased the question she repeated her answer and made it clear that she had not misspoke. She sat and answered reporters' questions for ninety minutes. A reporter asked her about the situation with the Rohingya, a persecuted Muslim minority in western Rakhine state. The reporter called the Rohingya situation "dramatic." 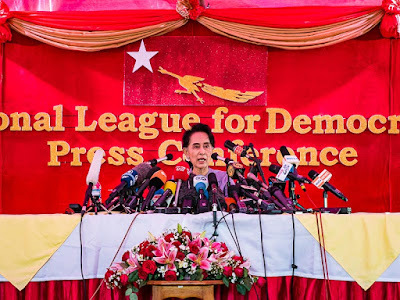 Daw Suu answered that the situation in all of Myanmar was quite "dramatic." I heard her use the phrase "Bengali immigrants," what the Burmese frequently call the Rohingya. When she was asked another question about the Rohingya, she said the media (meaning US/European/Australian media) must not "exaggerate" the problem. The NLD's campaigning on a platform of change. At one point Daw Suu said, "great majority of our people remain as poor as ever." Which is certainly true. I've been coming to Myanmar for six years. On the surface there are unmistakable signs of progress. Politically, people who once would never talk to me now can't be stopped from talking. The streets are even more congested than Bangkok's. And the cars are new. (Although Bangkok still wins with a much higher number of BMWs, Mercedes, Bentleys etc.) There is new construction all over Yangon. But it's all on the surface. Burmese are still achingly poor. The gap between those who have and those who have not is huge and seems to be growing. The Burmese I talked to know this. They look at the expensive condos going up in Yangon and know the buildings are for the elite (called "cronies" here because they're friends of the generals or members of the generals' clicques) and foreigners. They still live hand to mouth and see the "progress" as a charade that has passed them by. They're ready for change. There are more photos of Aung San Suu Kyi's press conference in my archive or available from ZUMA Press.